In close concert with French and British troops, which occupy the Suez Canal, Israeli troops conquer the Gaza-Strip (29.10.1956) and advance onto the Sinai. After diplomatic interventions from the USA and the Soviet Union, the foreign troops have to withdraw and Egypt regains control of the Sinai and the Gaza-Strip by 7.03.1957. 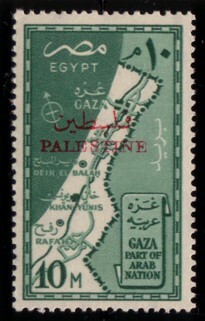 A commemorative stamp showing a map of the Gaza-Strip is issued in Egypt on 4.05.1957. 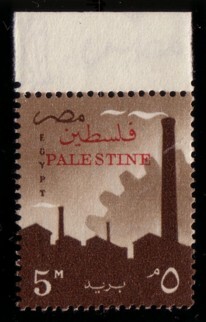 That stamp, although in changed colours (blue-green instead of deep turquoise-blue) and with a newly-set overprint (type 9, in red), is issued instantly for Gaza. 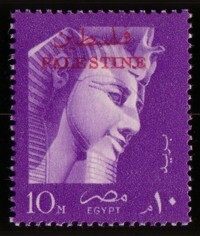 In the autumn of 1957 Egypt starts to issue a new series of definitives which will eventually run until January 1964. 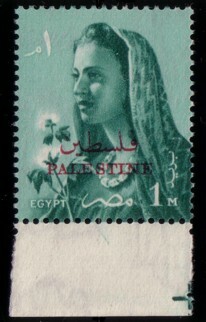 Several early values, with two types of watermarks (W158 and W161), are issued with overprint for Gaza. 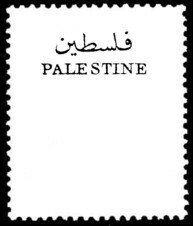 It is not until 1960 that the designation Palestine will be incorporated into the actual design of stamps. Commemorative issue of 4.05.1957: Design type 152 (map of Gaza-Strip) printed in recess on paper with watermark W48. 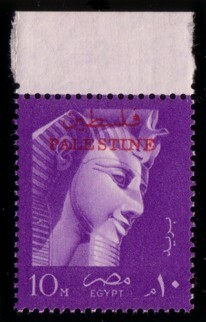 For the Palestine overprint this stamp is printed in colours changed from those used for the Egyptian issue. Definitives of 1957/1958: Design type 160 (Ramses), 160a (female fellah) and 160b (industrial silhouette) in various perforations. 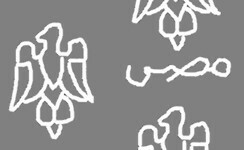 Produced in recess with watermarks W158 and W161. Values of 1, 5, and 10m. Upon controlling the perforation measures of the base stamps and the overprints, one detects some very striking variations. These variations apply not only to the two leading catalogue publishers (SG and Michel), but also for the independent measurements I and fellow collector Thomas Schubert have taken personally. Reasons for these inconsistencies are hard to tell, presumably there are differences in the quality of perforation gauges. In addition to that SG generally rounds to the next higher 0.5 value. It should also be noted that the publishers tend to adopt data once measured for new editions of their catalogues, often over decades. 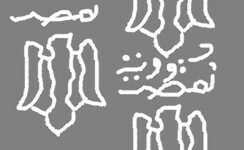 Improved (electronic) measuring techniques are reserved for newly issued stamps only.